Are you hunting for the best leather IWB holster that will be reliable in times of need while still remaining discreet when not in use? IWB holsters are known for being both easy to access and easy to hide, but the best benefits of using an IWB holster only apply if you have a good product, to begin with. In particular, IWB holsters that are made of leather are known for being better than metal or plastic clip versions. But how can you determine which is the best one for your preferred carrying style? To figure this out, we can take a look at three of the best IWB holsters right now. Based on each of their features, pros, and cons, you’ll be able to find a great holster that serves you well in years to come! This leather holster is a solid holster choice made by Winthrop Holsters, LLC. In particular, this design is great for those who want to be able to conceal their gun in their waistband while still having some comfort and flexibility. This leather holster is made of cowhide leather that is between seven and eight ounces. Overall, it measures about 3.15 inches in length. This model is made specifically for the Kimber Micro 9mm pistol and should not be used with other sizes as this would put you at risk of accidental firing. Winthrop Holsters suggests that this holster is slightly in front of the side seam that is in your pants. When worn properly, the holster’s back will be angled towards your back pocket. While this particular model is made primarily for those who are right-handed, they can make custom left-handed holsters as well. Another benefit of buying this particular leather holster is that it is made in a small factory, so there is a good quality assurance factor. 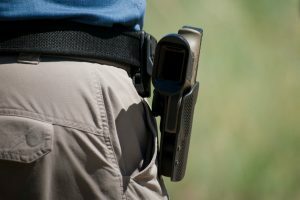 Despite the potential for issues, this holster boasts durability and reliability even at a relatively low price point. This leather holster is another great choice for those who want a high-quality product, and it is once again made by Winthrop Holsters, LLC. They make very durable products that are a perfect fit to your pistol, so simply finding the correctly-sized holster is all that you will need to do. This particular IWB leather holster is made for the Ruger LCP II, and it is a great fit. The leather will be a very tight fit when you first try it out but simply breaking it in for a few days, as instructed, will fix that in no time. You want to have a very secure fit, and that is possible with this type of durable leather holster. The spring clip on this belt is specifically made for 1.5-inch belts, but it can also be used directly on the waistband in some situations. As with most IWB holsters, it is recommended that you wear this holster at three or four o’clock, with the holster resting just in front of your pants’ side seam. This will give you a secure fit that is still accessible, concealed, and comfortable. Finally, let’s talk about a leather holster that is made specifically for the Ruger LCP 380. This IWB leather holster is designed and manufactured by Cardini Leather, and they use either black or brown premium cowhide leather to make a durable yet fashionable product. This IWB holster has a single spring metal clip, which can fit belts up to 1.75 inches in width, so it’s good for those who like to wear a slightly wider belt than most standard IWB holders can fit. Once secured, the steel-tempered clip is unlikely to budge until you choose to remove it from your belt. This ensures protection and safety. Additionally, the interior lining on this particular holster is something to talk about as it is lined with suede. This interior gives maximum comfort to you while also protecting your firearm from damages that could be caused by a rough lining. Because of the narrow design of this holster, it can move with more flexibility than many other IWB holsters, and this makes it a more comfortable choice for many people. When you want to carry and conceal, comfort is still important, and this holster is quite comfortable. When it comes to picking the best leather IWB holster, the simple fact of the matter is that your choices are going to largely be decided by what gun you have. Each of these holsters is intended for different guns, but some of them can fit more than one model depending on the size. Still, we have to say that the Winthrop Holsters Kimber Micro 9mm Leather Holster is the most reliable of these three products. It’s superior stitching and durability at a great price simply cannot be beaten. Plus, the manufacturer can make simple customizations at your request if it isn’t exactly what you’re looking for! The key fact is that you can find a great leather IWB holster to conceal and carry with from this list, and that should make you very happy!